Beyond what is found in the Girl Scout books, are you looking for additional activities to do with your girls while they work toward their Girl Scout Ways Badge;? 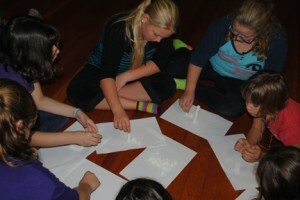 During a Girl Scout meeting, I had my Juniors, Cadettes, Seniors and Ambassador girls worked on their Girl Scout Ways badge. We split up by level and worked on parts of their badge. Then we got back together to do some activities that really built on what the Girl Scout Ways Badge really stands for: Girl Scout Traditions and the idea of sisterhood. 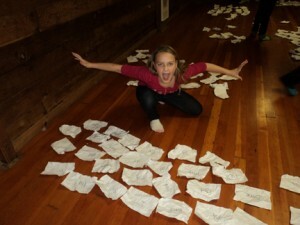 Each girl is given 26 half sheet of paper with one word from the promise on each piece. Divide the girls in half with a line in the middle. When you say “go” the girls crumble the papers up and have a snowball fight – time it 3 -5 minutes. When the girls are done – they have to scramble and pick up the pieces and put together the promise in the right order – first girl to complete is winner. Go through the list and explain to the girls what each thing represents. Then cover the items and tell the girls they must now list everything they can remember from the table and also what they represent. For every item they remember get 1 point for every description they remember they get 2 points. The girl with the most points wins. Tomato can: having nothing else on hand to put her honor pins in, Juliette grabbed an empty tomato can and carried the pins to a meeting in it. Paper daisy: Juliette was called Daisy. Rubber worm: Juliette loved fishing. It was not unusual for her to go fishing in her evening dress. White glove: Juliette could be found cleaning the house in her evening wear. Scouts in the United States for several years. Rice: It was a piece of rice thrown for good luck at her wedding that may have been the cause of Juliette being partially deaf. It lodged itself in her eardrum. Teabag: Even though Juliette lived in a time when tea was served regularly, she spent 6 months drinking water (instead of tea) as a bargain with her butler to help him quit drinking. Book: Juliette loved to tell stories. She wrote many stories herself. Fish: Juliette was one of a very few people ever outside the United Kingdom to be awarded the Silver Fish. A card with the word “Bonjour”: At boarding school, Juliette learned French. She used to write letters home to her parents in French. Pumpkin: Juliette was born on October 31, 1860. Paint Brush: Juliette was also very good at painting. Turkey: Claiming decapitation was inhumane, Juliette used chloroform instead to “put to sleep” the Thanksgiving turkey. It was plucked of it’s feathers and put in the icebox. The next day when the icebox was opened to prepare the turkey for dinner, it awoke and jumped out of the icebox, scaring the cook. British Flag: Juliette loved spending time in England and Scotland. She had troops in both places at one time before coming to start Girl Scouts in the United States. A picture of Lord and Lady Baden Powell: These were good friends of Juliette’s. Lord Baden Powell started Boy Scouts and got Juliette interested in Girl Guides. They were known as the World Chief Scout and the World Chief Guide. Throw a beanbag in the air, turn around, and catch it again. Throw the beanbag up and backwards over your head and try to catch it behind your back. Throw the beanbag in the air, clap your hands once, and catch it. Then try clapping your hands twice, then three times, and so on. How high can you go? Throw the beanbag up, jump and try to catch it. Jump twice, jump three times so on. Throw it up, kneel down and try to catch it. Throw and catch with just your right hand, then do with just your left. Try throwing it up and catching it with your eyes closed. Balance the beanbag on your right foot, then throw it up and catch it from there, then do the same with the left foot. Balance the beanbag on each shoulder while you walk, run, jump etc. We set up variety of hoops, containers and targets for challenges. Doing them underhand and over arm. Using Sugar Cubes have a contest to see who can make the highest tower. birthday both fall when it’s too cold here in PA. I don’t plan on camping in March and a local park closes for the winter. How are we supposed to help clean up a campsite? That would mean we can only complete this badge during a small time frame. Maybe I’m reading into it too much. There are other places that you should be able to clean up. I don’t have Cadettes but maybe a weekend trip to the local park for clean up then someone’s house for hot chocolate? Thanks Gayle. I’m looking into going to a local environmental center to help clean up. I guess I read into the badges a little too deeply sometimes.